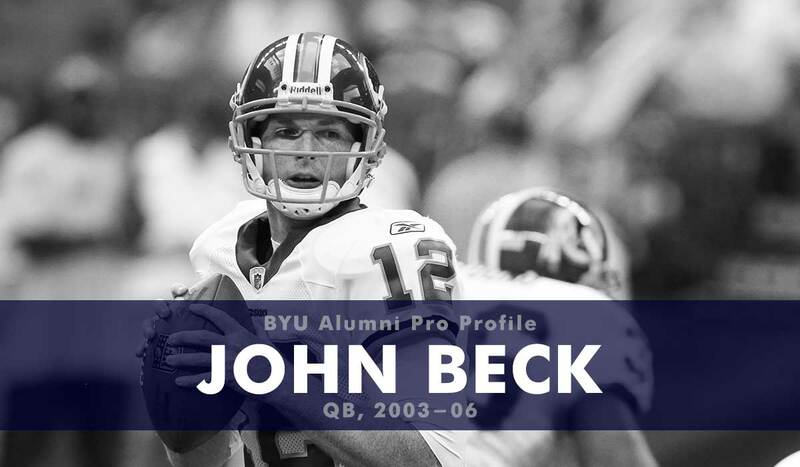 Following an LDS mission, Beck played in eight games for BYU (with four starts) as a true freshman (2003). As a sophomore he earned All-MWC second team honors and started 10 of the Cougars 11 games. He broke the BYU and MWC record with 67 pass attempts on October 8, 2004. As a junior he was an All-MWC first-team selection, throwing for a league best 3709 yards. As a senior he led BYU to a 10-2 record and was a finalist for the Davey O’Brien award. His defining moment was “Beck to Harline” for the game winning TD throw against rival Utah. After being drafted in the second round (40th overall) of the 2007 NFL draft, Beck started four of the five games he played in as a rookie. He completed 60-of-107 passes for 559 yards and one touchdown. He signed with the Baltimore Ravens in 2009 and re-signed with them in 2010 before being traded to the Washington Redskins. He played in four games in the 2011-12 season (starting three) completing 80 of 132 passes for 858 yards, two touchdowns, and four interceptions. He also rushed 10 times for 43 yards and a touchdown. He then signed to the Houston Texans and then transitioned from the NFL to the CFL and signed with the BC Lions (2014). Beck played in eight games for the Lions as a backup, completing 19 of 41 passes for 287 yards, five TDs and no interceptions. On September 30, 2015 Beck announced he was retiring from professional football. He is now a throwing mechanics expert and quarterback consultant for 3DQB in Los Angeles where he has trained quarterbacks like Josh Rosen (Arizona Cardinals) and Luke Falk (Tennessee Titans).